South Carolina has a coastline that is legendary for its quaint, historic cottages, sprawling resorts, and deep Southern charm. There are many beautiful beachside towns and cities in South Carolina, but these five are the most memorable for your next vacation. A mere 25 miles southeast of Charleston, Kiawah is a small, barrier island known best as a holiday and vacation destination. Featuring seven top-ranked golf courses planted with beautiful native flora, this is truly a golfer’s paradise. Thirty miles of paved trails and ten miles of beach mean that cyclist, walkers and joggers can indulge for hours on end. Rental kayaks, canoes, and chartered deep-sea opportunities abound on the island, so fishermen and bird-watchers alike can find their happy place here. Kiawah is also home to pristine beaches ranked as the best in the country for those seeking seaside peace and quiet. Colloquially called the “Edge of America,” Folly Beach offers the down-home feeling of a small-town surf spot less than twenty minutes from Charleston. Home to a fishing pier stretching over one thousand feet into the Atlantic, this is a lovely place to trot out your tackle and rod and spend a day casting a line out into the waves. Locals surf the waves here, and there are surfing lessons available for the adventurous. It is also home to Porgy House, where composer George Gershwin wrote most of Porgy and Bess. Boasting the largest resort on the Grand Strand, Myrtle Beach is the most happening place in town on the South Carolina coast, hands-down. Summertime is primetime on the beaches along the Strand, teeming with amusement and water parks against a backdrop of live entertainment and restaurants galore. Away from the entertainment complexes and action, Myrtle Beach is a lovely, white-sands beach offering great natural resources for fishing, swimming, sailing, and surfing. Rent a Myrtle Beach beachhouse. Tucked away in Edisto State Park, this park offers the longest system of ADA accessible hiking and biking trails. A beachcomber’s delight, this beach is best known as a treasure trove for fossil and shell collectors. Sailors and fisherfolk are sure to find abundant opportunities here. Pro-tip, with a mile and a half of sugar-white coastline fringed with palmetto trees, this is one of the most Instagram-friendly beaches for capturing fairytale sunrises. 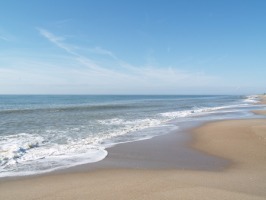 Book a beach house on Edisto Beach. The Isle of Palms is nestled away from the hustle and bustle of Charleston and the many tourist-beaches. Here you will find a sleepy escape for nature-lovers craving serenity. For public access to swimming and sunbathing, Front Beach is a perfect retreat where sea turtles nest seasonally and lay their eggs in the dunes. A private-beach can be accessed via the Wild Dunes resort on the the northern tip of the island for a more secluded experience. Here you will find family-friendly accommodations with spotless beaches, outdoor activities and facilities for golf and tennis aficionados. There are countless beaches on the South Carolina coast, but these should give you a clear idea of where to go whether you seek a good party or just some sweet solitude. James Witts is an eco-conscious home improvement writer. He is constantly trying to find new ways to live off the grid while living in a tiny home with his wife, Andie.